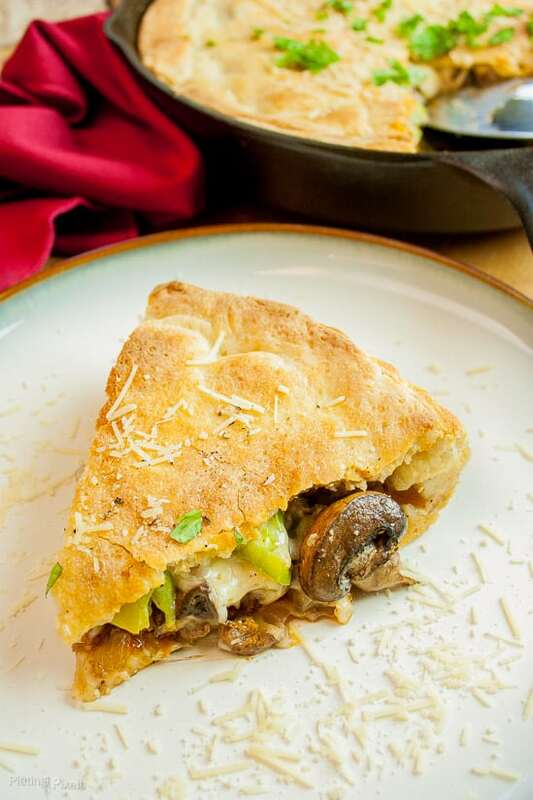 Easy Restaurant Style Skillet Calzone recipe you can make at home. 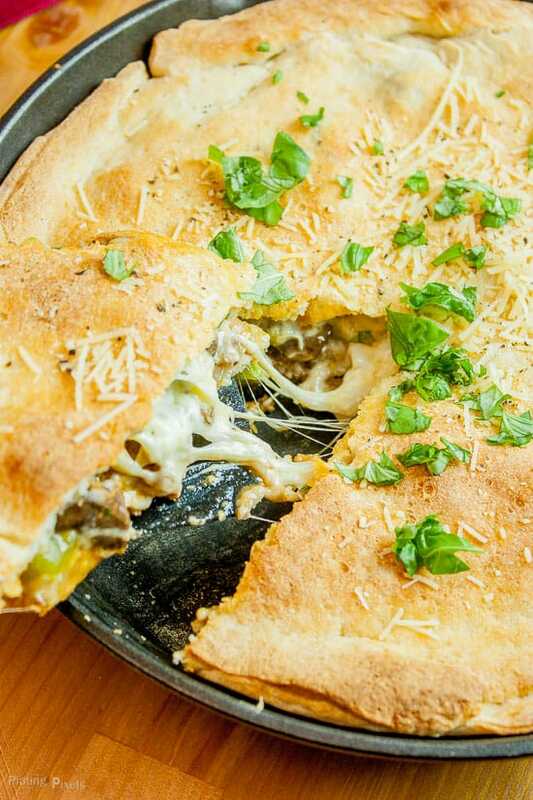 Meaty, gooey cheese center with crisp veggies in a chewy, flaky and buttery pizza dough shell. 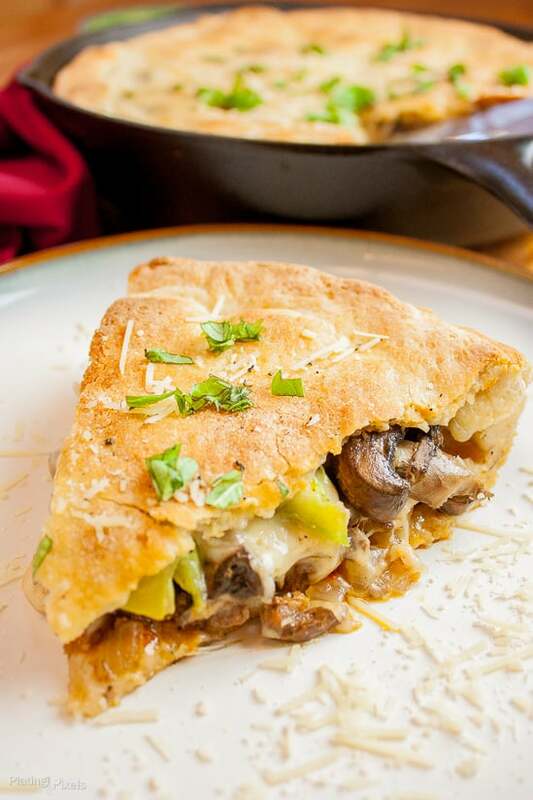 Within this recipe post you’ll learn how to make an easy restaurant-style calzone in a skillet; as well as how to substitute ground beef for Italian sausage, and the difference between green and warm colored bell peppers. Olia and I have a thing for romantic movies. Actually she started it, but I do cherish the time we spend together watching them. While we go out for dinner and events, there’s something about spending a nice night in with a loved one. A dinner and a movie at home is a worthy alternative to it’s night-out sibling. What better way to enjoy it than with a Restaurant Style Skillet Calzone? When you think of cheese, especially mozzarella or Parmesan, what comes to mind? For me, Italian food instantly comes to mind. Hence the rich, hearty and fun skillet calzone. I opted for pre-made pizza dough for the shell. Cook ground beef, or you can use Italian sausage for a more authentic pizza flavor. I know a little trick to make beef just as good; it’s just one secret ingredient that you need. Read the cooking tips section for details. 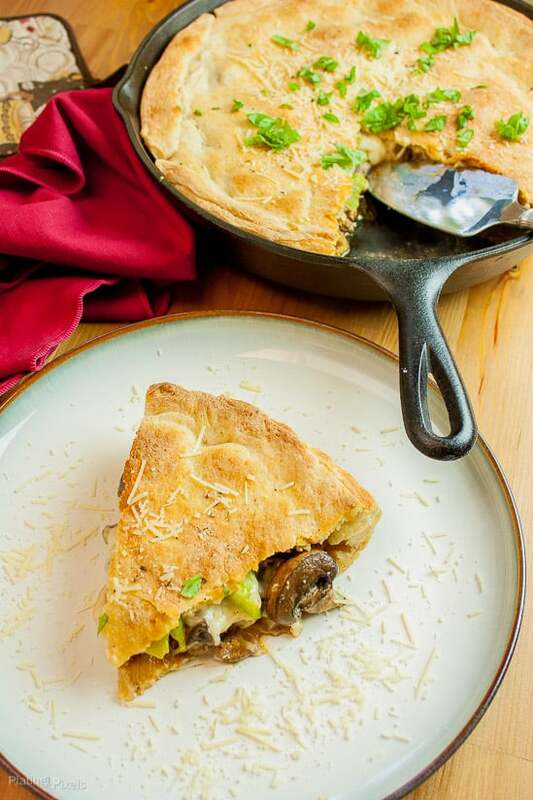 Onions, mushroom, green bell peppers, and of course cheese, is all you need for a perfect Italian restaurant-style skillet calzone dinner in. Did you know green bell pepper come from the same plant as red, yellow and orange? The only difference is they are picked sooner, and less ripe, therefore less sweet. Read more on green peppers from the Kitchn. What is the main flavor of Italian sausage, and can you substitute ground beef? Fennel seeds are the main ingredient that give Italian sausage its unique flavor. This is my preferred choice when making any Italian dish with meat. If you don’t have any sausage in stock, or want to use more affordable beef instead, add fennel seeds. About 2 teaspoons per pound is all you need. Add it while you are cooking the beef to infuse seeds and flavor into the meat. Flavor profiles: Savory, meaty, cheesy and buttery. Texture: Chewy and crispy pizza dough filled with a creamy, gooey, cheesy center, tender ground beef, and a bit of crunch form veggies. Dietary Options/Substitutions: For vegetarian, omit beef. Notes: If you don’t have a cast-iron skillet, you can try in a pie pan, but I haven’t tested this. Easy Restaurant Style Skillet Calzone recipe you can make at home. Preheat oven to 400º F. Heat a 12-inch cast iron skillet over medium-high heat. Add ground beef, onion, and seasonings from fennel seeds to salt. Cook until meat is browned, 7–10 minutes, breaking up meat and stirring during cooking. Drain excess oil and place mixture into a bowl. Allow skillet to cool slightly and wipe off with paper towel. Evenly sprinkle cornmeal in skillet (this adds flavor, texture and helps prevent sticking). Place dough from one can in bottom and press up into sides to reach the top of the skillet (you may need to cut of square edges or mold into a circle shape). 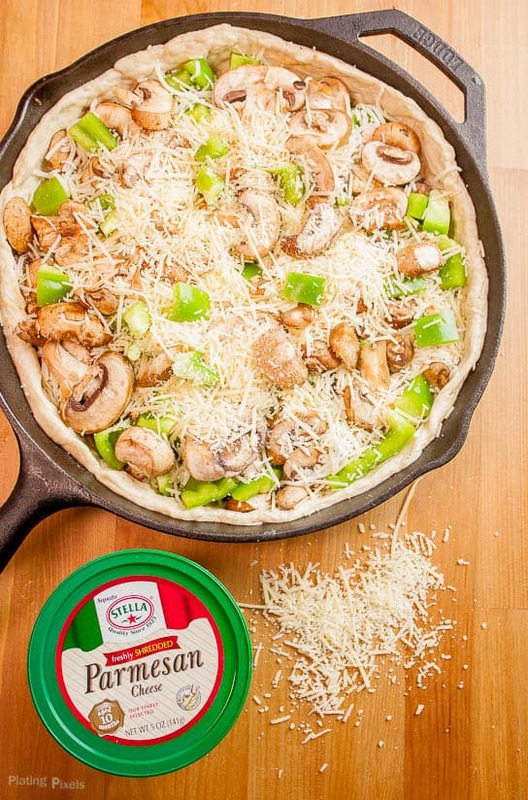 Spread on sauce, top with meat mixture, sprinkle with mozzarella, mushrooms, bell peppers, then top with Parmesan cheese. Place remaining dough sheet on top, then press into edges of bottom dough to seal in all ingredients. Cut a few small slits on top to let out steam while baking. Bake 25 minutes, until crust is golden brown. Remove and let cool 5–10 minutes before slicing. Top with optional basil leaves. Do you prefer a pizza or calzone, or have you ever made a skillet calzone? That’s a delicious looking calzone! What a fun take on a calzone! I love the fillings here and this is beautiful…it reminds me of a savory meat and cheese pie! Definitely a crowd-pleaser. Thanks so much Faith! Good point, it pretty much is a large savory meat pie. This looks so good! I love anything wrapped up in dough – like this calzone! That’s my motto too. Thanks Anita! This looks and sounds wonderful and I really wish I had a large serving of this right now! Thanks so much Kimberly! It makes plenty for leftovers. Yum! I want a bite of that right now! Looks delicious! I’d share one with you if I could. Thanks Carol! Calzones are my JAM! And this one looks awesome. I think they are mine now too! It’s like a pizza in a pie. Thanks Brandon! This is a really satisfying way to serve a meal. This Calzone looks wonderful! It definitely is, and hearty! Thanks Ginny! What a great idea, Matthew! Looks and sounds delicious. I love making calzones at home, but yours is the real deal. This looks SOOO good! I’m a new fan as well. Thanks Nichole! This looks filling and delicious! It sure is! Thanks Megan! This looks so good! I’d have to skip the mushrooms- would that still be okay? Looks so yummy. My family would love it. Thanks! Sure you can totally skip the mushrooms Christina. My brother isn’t a fan either and refused to eat them. Sounds delicious, I love a good calzone! That was my first too but they’re super easy Ilona. Thanks! holy moly, this looks amazing!! I am definitely making this this weekend! thank you for sharing! You’re welcome and hope you like it! Thanks Kristen!